Chapter from the book: Lim, S. 2019. 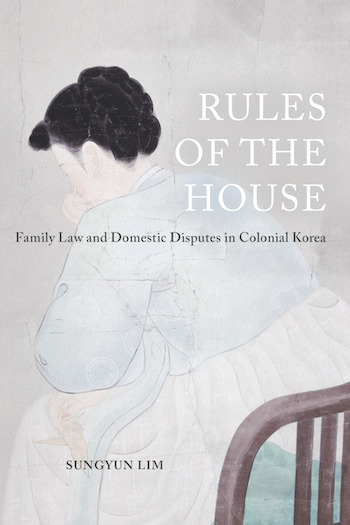 Rules of the House: Family Law and Domestic Disputes in Colonial Korea. This chapter examines the reform discourses over daughters’ inheritance rights that emerged in the 1920s and the 1930s. Following the Civil Ordinances reforms in the early 1920s that expanded application of the Japanese family laws in Korea, the government-general tried to implement son-in-law adoption (muko-yōshi) in Korea, couching this in the language of progress. This proposal drew widely divided responses from the colonized Koreans: while many Korean women enthusiastically supported the measure, the backlash from the conservative elite was significant enough to cause postponement of the measure until 1940. When son-in-law adoption was eventually implemented in 1940, it was with a significant compromise with the principles of Korean lineage that denied inheritance rights to daughters and non-agnatic kin. As a result, daughters in Korea were denied the right to become female household heads on their own.